Trigger warning!! This question tends to spark a near-religious debate on knife forums. It inevitably results in a free-for-all with everyone pushing the knife they like best. And therein lies the answer… or the path to the answer. What’s the use case? What is this knife FOR? A knife is a tool like any other. And the right tool is the one that meets the job, the one that meets your need. A knife is a tool like any other. And the right tool is the one that meets the job, the one that meets your need. Many of us know and live by the old saying… “Never go anywhere without a knife.” The knife is one of man’s oldest tools. And to this day, one of the most useful. But we all have somewhat different needs for our tools. So how do you find THE right everyday carry knife for YOU? Read on, we’ll find it together. First, let’s decide between folders (folding knives) and fixed blades (non-folding knives). How do folding knives really differ from fixed blades? A fixed blade knife – especially a good one – is going to be far more solid than a folding knife, generally speaking. That’s because a fixed blade knife is essentially a solid piece of steel with scales (the knife handle) bolted on. In comparison to a fixed blade, a folding knife is a piece of steel (the knife portion that cuts) attached to a handle by a pivot of some sort… and the knife portion folds into the handle. But aren’t some folding knife locking mechanisms downright bulletproof? Knife makers talk about the strength of their locks, and how some are damn-near unbreakable. Well, that’s sort of true… on one axis, the pivot axis for the knife opening and closing of the knife. Sure, there are some very sturdy folding knives out there – and there are some damn poorly done fixed blade knives. But generally speaking, a solid chunk of steel is going to be stronger than a folding knife. That said, a sledgehammer is even more solid than s great fixed blade knife, but you’re not going to jam that in your pocket… so really it gets back to the right tool for the job. Pro tip: Don’t pry or scrape with a good knife. You’ll bend the blade, ruin the edge, and render it useless as a knife. Use your tools as they are intended to be used, and they’ll serve you for a very long time. In most cases, you’ll want to go with a folding knife because of sheer portability. This allows you to get a large-enough-to-be-useful-sized blade into a very short overall package. So you can easily carry a knife with a 4″ blade, and in your pocket folded it will barely take up over 4″. In contrast, a fixed blade with a 4″ blade will usually take up 9″ at all times. Not so friendly on your person all day, in most cases. Unless you’re gonna wear it loud and proud hanging’ off your belt in full view. Not really a fit in most suburban / metro areas, but hey… whatever floats it for you. Of course, in the woods, one the ranch, out in nature, there’s not a damn thing wrong with hanging a good-sized fixed blade off your belt. Right next to your open-carried Glock 19 and 2 extra mags. Another near-religious discussion among knife guys… serrated or not? First, let’s get something straight: both edge options are just fine. We’re talking about the “better” choice here for your specific needs. Conventional wisdom says if you’re going to be cutting rope or other things that require “tearing”, not just cutting… then serrated is always the way to go. Yep, that’s true. Yet most folks don’t keep their blades shaving sharp EVERY DAY, so it’s a moot point. Most people opt for a plain edge otherwise. It’s very quick and easy to sharpen, and nearly as effective as a serrated edge if you actually keep it sharp. A serrated edge is comparatively much harder to sharpen. Personally, I like to have a plain edge and a companion serrated edge knife as well. But if for some reason I only grab one blade, it’s almost always a serrated one. Everyone has their preferred brand… be it guns, knives, cars, etc. This comes from what familiarity over years, from familiarity over the years, from a perceived quality perspective, from the deal you got last week, etc. For knives, these days I tend to go with Spyderco. 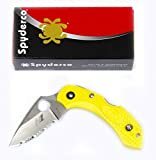 I discovered Spyderco some years back, and have been carrying the Spyderco Military for a few years as my everyday carry blade. It’s an awesome knife, can’t recommend it enough. Slowly I worked my way through their other products and have been consistently impressed with the quality they put into the engineering, design, and production of their products. In a way, it’s why I carry a Glock. I’m familiar with it from years of use, and it’s a damn good tool that just works well and reliably. I feel the same way about Spyderco products, tho Spyderco is a far more customer-focused company that actually interacts with their customers and tailors their designs to their requests. OK, the moment you’ve been waiting for. Let’s get to it, shall we? After years of testing, comparing, and reviewing, these are my personal favorites. Any of the following are GREAT choices to start with. Buy one, buy all, or take your time to research before you buy them all anyway like I did lol. I struggle with using terms like “best knife” or “best EDC knife” because that’s such a moving target. That said, I often grab this knife if I’m going to carry just one. For some time now, my regular EDC has been the most excellent Military, with a recently added SE Pacific Salt companion blade. Both excellent knives, strongly recommended. To my surprise, over the past year, the Pacific Salt has become the one to grab when I only carry one, i.e. running, at the gym, etc. Basically, the good-sized nearly 4″ blade, very narrow profile, light weight, combined with its solid build is a no-brainer. Pro tip: Buy. This. Knife. Rust resistance against sweat is also handy, quick rinse and you’re done. Also, surprisingly, the Pacific Salt is even comfortable against bare skin clipped inside running shorts or inside a belly band running holster for the Glock 42. Seriously, get one. The only downside is you’ll end up getting more than one (way more than one lol), like I did. See the long overdue but finally published Spyderco Pacific Salt Knife Review. Recently I’ve rediscovered my first Spyderco knife, the Resilience. The Resilience isn’t super light and sleek like the Pacific Salt or the Military at all. It’s also not made of a fancy super steel, and it doesn’t feel as refined as the Military. So for my day-to-day needs, it’s not the choice for EDC. BUT… it’s a damn solid, overbuilt knife with a good-sized usable blade, it cuts well, and it has good ergonomics. It’s inexpensive (read: good value for what you get), easy to sharpen, and tough. Heck, I’ve even whittled with it out of curiosity lol. That means when I need a heavy duty knife to cut up some boxes or do whatever else, this is the knife I usually grab. I keep one on my desk for general stuff like opening boxes, etc., and just got another one for my daily grab ‘n go bag (the 5.11 MOAB 6 bag) – highly recommended). Also got a Tenacious to keep in each car… same concept. I REALLY like this knife. Pro tip: Get. This. Knife. Awesome, tough, overbuilt, well designed, comfortable, and very affordable. Nothing on the market touches this knife at under $50 delivered. Get one. If you don’t end up using it for everyday carry, it’ll make a great knife to keep on your desk to open boxes or in your glovebox to open whatever may need opening. See the Spyderco Resilience Knife Review. 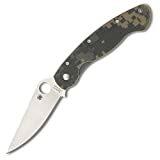 The Spyderco Military is one of the best-known and most well-respected everyday carry knives of the knife world. It just strikes an incredible balance between lightweight, strength, and ergonomics. Yeah, some people think it’s too large. Whatever. Buy one and use it for a couple of days… the size is perfect. And it looks wicked. This is one beautiful, yet supremely functional knife. Super light (3.2 oz), 4″ blade, great steel, incredible ergonomics, damn well designed and executed knife. In the “if you can grab only one knife” genre, the Spyderco Military would be a damn close contender. Perhaps that’s why when I look down, there’s still one clipped to my pocket. See the Spyderco Military Knife Review. I like big knives. By big, I don’t mean an 11″ KA-BAR Kukri machete (which I love too btw), but for everyday carry I’m a big fan of a 4″ blade. Over the years, I’ve found you can do a lot with a knife that size, including small knife tasks, but you can’t do big knife tasks with a small knife. That said, sometimes you want a small knife, with a 2″ blade. Whether you’re concerned about offending the delicate sensibilities of folks afraid of their own shadows – or just want a small serrated blade as a companion to your primary 4″ everyday carry plain edge – the right small knife sometimes makes a lot of sense. 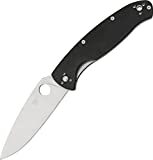 Spyderco has a concept called “little big knives.” The Dragonfly is a perfect example of that genre. Little big knives just means a very small and ultra-portable knife that’s designed to still be usable – in a way that usually only far larger knives are. The engineering and resulting ergonomics of these knives are very impressive. This knife can even be kept on a key chain, it’s that small. Pro tip: the Dragonfly makes a great first “real” knife for your kids. It certainly did for mine. It’s big enough to be a useful and real tool, but small enough to not be menacing or really dangerous for first-time users. And it also comes in yellow, a great non-threatening and highly visible color for a kid’s first knife. Of course, as the responsible adult, it’s up to you to teach your children about safety of everything in their world, including guns, knives, electrical outlets, hot stoves, etc. Adulting… it’s what’s for dinner. Man. Up. See the Spyderco Dragonfly Knife Review. If you’re looking for a fixed blade knife to carry, it’s truly difficult to find a better knife than the Spyderco Temperance. It’s not cheap. At $200 delivered, I hesitated for some time before getting one. But as we all know after a few decades of living, you generally get what you pay for. And I couldn’t be happier with this knife. Yes, the steel is VG10, not a more exotic super-steel. Pro tip: Don’t be a steel snob, VG10 is a great stainless steel that’s easy to sharpen and just works. Oh, and it doesn’t rust. This is one beautifully designed and executed fixed blade knife. Perfect ergonomics… this knife feels like it was made FOR your hand. It’s solid, yet comfortable in the hand. And the perfectly machined micarta scales don’t just look great – the provide excellent yet comfortable purchase in both dry and wet. The leather sheath is a really nice touch. It hooks on your belt with no problem for everyday carry. I almost always opt for the plastic sheath varieties, but I’m so glad I was willing to try this leather sheath. It’s excellent. I truly love this knife… wish I’d gotten it the first time I ran across it a couple of years ago.